This month Michelle, over at the GPP Street Team site, asked us to mix our own colours and name them. How could I resist? 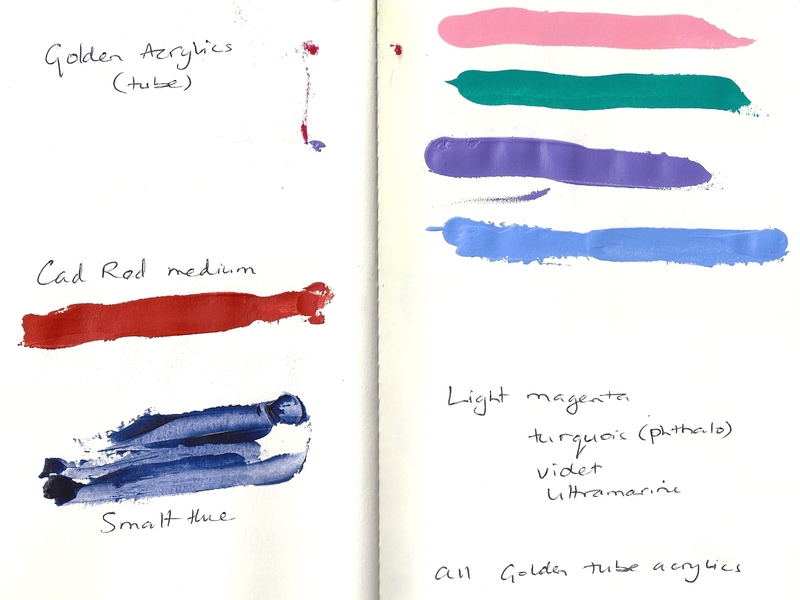 As I’ve said before, when I get new paints I always play round with them in my journals, recording the new colour and mixing them quite randomly to see what happens. It’s amazing what you find. Yesterday I had some new Golden acrylics arrive in the courier: light violet, light turquoise (phthalo), light magenta, light ultramarine and Smalt hue. I love the Golden light paints; I find they’re much more intense and less chalky than mixing my own lights. I quite like some of these mixes. Three rows down in the centre on the right hand page is now officially called Mana Bay Blue after our local beach. Bottom right is a mix of Cadmium Red medium and Smalt Hue. This is now Vampire Blood because it has a slightly metallic look to it, it reminds me of all the vampire books my library customer’s read! Cath, love hearing that you went right to the page with these new arrivals! Fun to see the record of the true colors, then the evidence of your mixes. Hooray for naming the collection after your beach….hardly a beach day for you in the winter….meanwhile it was 105* here today! 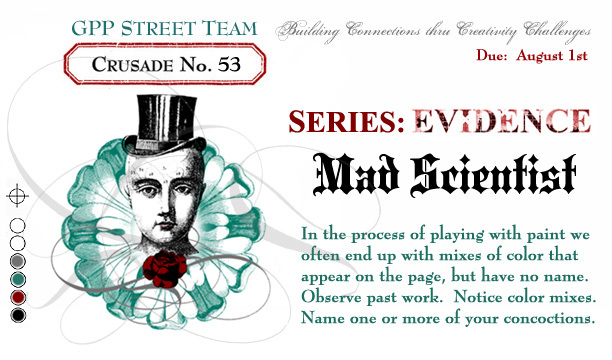 Love all the values you’ve concocted – especially Vampire Blood! Love seeing these kind of pages. Thanks for sharing with the team! 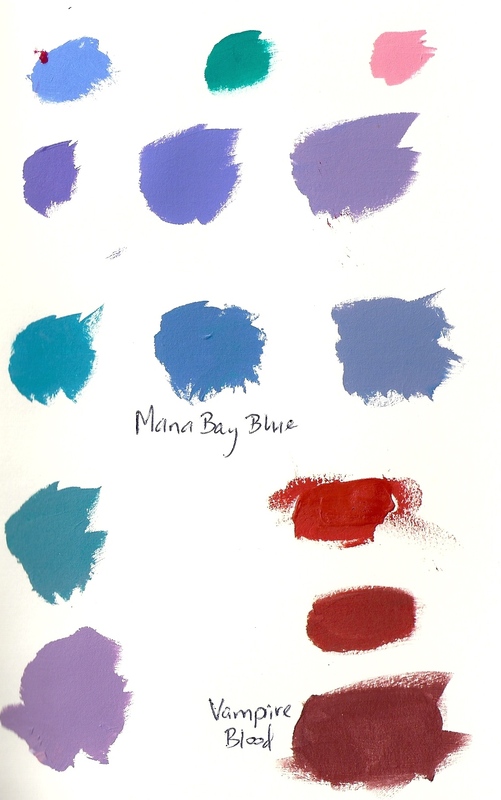 I like to make mixes of my new paint colors in a journal, too. The Golden Acrylics are wonderful & so highly pigmented – yum. Your blue mixes are so cool! I learned from one of their educators that you may want to mix modern pigments with each other and traditional pigments with each other. Modern and traditional blends can be done, but usually the mixes usually aren’t as satisfying. 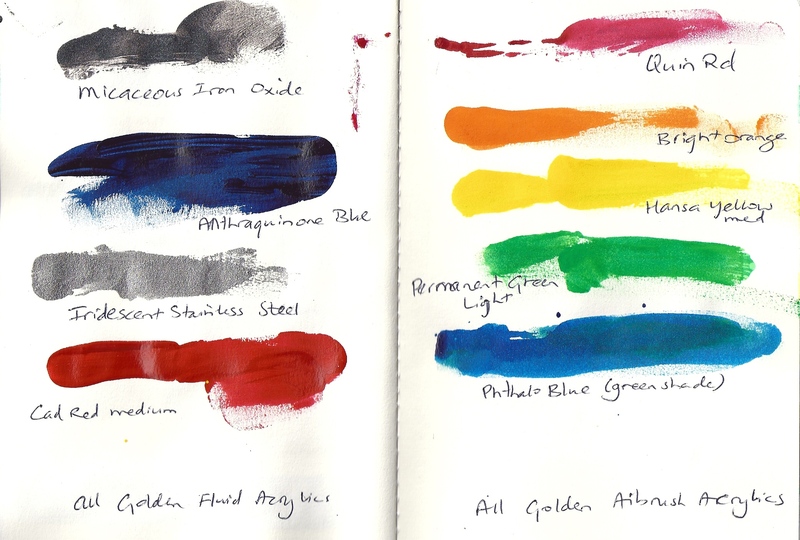 Modern (manufactured) pigments would include the quinacridones, phthalos, etc. Traditional (earth) pigments are umbers, siennas, etc. If you are interested in learning more, you can check their web site. We all know we should do this! I work with dyes, and try so hard to always do samples like this, but of course time is always an issue. So good to play and ‘break the rules’ too. I use my Goldens for printing onto fabric – they are a lovely addition. Thanks so much for popping into my miniartworks blog and for leaving a comment. Much appreciated. Lots of lovely colours! Love the blues and reds. I love to hear about you experimenting with old and new paints; it’s encouraging to hear that we CAN experiment without worrying! Love your mixes and colors. Speaking about the libary: I am afraid books are having a hard time, but I am convinced they will survive. Great colours and your vampire blood is just right! Vampire blood …that one made me laugh (after all, I was born in Dracula’s country). Love your experiments, very well done. Impress with the new ….vampire blood. Well, I think Vampire Blood is a big hit, and not only that, but I think seeing how you’ve laid these out and done stuff with them is groovy! Looking forward to your work on 54 !